Check out the loudest library in town! Denver Tool Library (DTL) is just what you are thinking it is – like a book library, but for tools. From hand saws to table saws, rototillers to paint rollers, cement mixers to sledgehammers, they have more than 3,000 tools for the community to borrow to make their projects a reality. As one of their members said, if you have ever used a butter knife when you needed a screwdriver, you know the value of Denver Tool Library. For just $80 a year, members can come to the Santa Fe Arts District shop and check out tools that cost twice that amount, as often as they need them. Why buy a tile saw if you only need it for one renovation? Their lucky tools avoid the sad fate of gathering cobwebs in a garage by being checked out every week. By the same token, members can try their hands at many different types of work, instead of limiting themselves to what they have the proper setup for. “What a great concept,” is the number one phrase uttered by first-timers, often followed by, “I’m looking for that thing that … you know, it goes …” and then some wacky hand gesture and sound effect. That is one of the best things about DTL – you don’t have to be an expert to belong. They intentionally create a fun and judgement-free atmosphere, so that tool users of any skill level can come as they are. Denver Tool Library opened its doors in 2015 thanks to people who believed a tool library would make projects more affordable, cut down on unnecessary waste and consumption, educate and empower individuals around tool use, forming a fun and connected community of folk eager to share skills and ideas as well as tools. They now have a membership of more than 800. They plan to expand their programming to include classes and workshops, including a long-term workshop series to renovate a bus or camper into a tiny home. This series is inspired by the dozens of members who have made their own tiny homes, buses and vans with the use of DTL tools. Denver Tool Library removes the hurdles to tool access, including money, space, knowledge and inhibition. 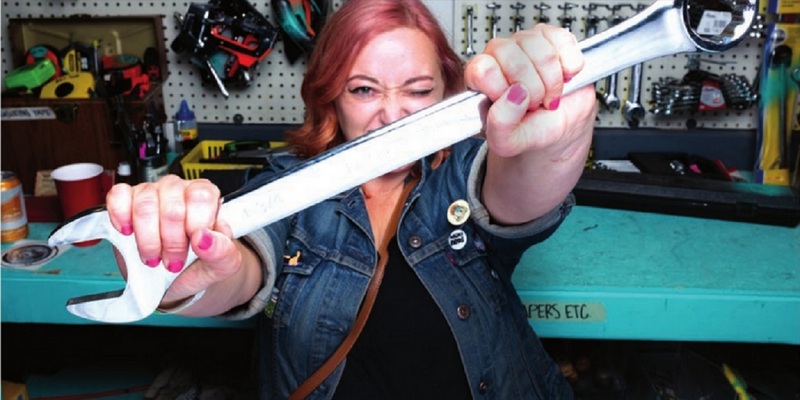 People from all walks of life can enter Denver Tool Library without fear of criticism or judgement and get the implements, instruction and inspiration they need to succeed in their projects. Whether you are a third- generation carpenter or a first-time drill user, there is a place for you at Denver Tool Library. You can learn more about Denver Tool Library and our other incredible members in the newest addition of Nonprofit Colorado!